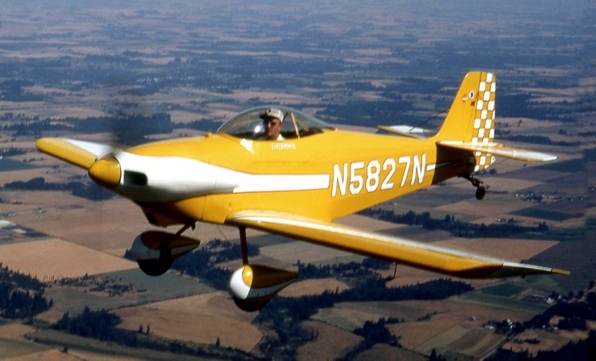 First flight of the RV-1( N5827N) after restoration occurred on 19 Feb 2012 from Hicks Airfield (T67) near Fort Worth, TX. Winds were light, favoring Runway 14. Minor adjustment were made to a new throttle cable immediately before the flight, and taxi tests confirmed that throttle action was much improved over the older, stiff cable. Engine was started to warm it up for idle adjustments, then the cowl was installed, and the airplane was fueled with 10 gallons of 100LL. Tank has been said to hold 22 gallons, but that has yet to be calibrated. All controls were checked for operation, and the engine was started and stopped several times – it is fairly smooth, and starts easily. Boost pump operation is normal, and was used for start (and for all flight operations). The voltage light n the lower left corner of the panel flashes (indicating low voltage) until about 1700 RPM’s are reached – it then goes on steady for a few seconds, then fades out as voltage goes up to normal – I suspect that the “steady on” indication is telling us that it is “low, but not terrible”, and it flashes when it is too low to charge. The light goes out at flight RPM’s, and we think this indicates good alternator operation. Taxi and take-off were normal for a tail dragger. The brakes are definitely sensitive, but once the pilot calibrates themselves, it should not be a problem – they need to be very careful the first time they are applied however. Lateral stability on the ground is not as positive as most RV’s – once the tail starts to swing, it feels like it would have a tendency to go around – more like a normal tail dragger than the very stable RV’s. The tail wheel is very firm, and sends considerable feedback through the airframe when hitting bumps – pilots should be aware – no damage appears to be done by this. Take-off was normal for an RV – tail came up in about 100 – 150 feet of roll, acceleration was good, and control at lift-off was positive. Speeds weren’t recorded on this flight, as we really don’t know how accurate any of the instruments are. The initial rate of climb was quite good – about what we would expect for the horsepower. The airplane felt well-trimmed with the tab in a neutral position, and pitch forces were normal. The airplane was climbed to 3,000’ over the field (field elevation approximately 850’), and several orbits were performed to evaluate handling. In typical RV fashion, roll and pitch are harmonious, and the rudder is fairly heavy at normal flight speeds. Roll and pitch are sluggish compare to a modern RV, but perfectly adequate and not out of the ordinary for production aircraft. Comparing it to modern RV’s, the controls are more like an RV-8 than an RV-4 – good, but not at all light. Trim is quick, but the range is not great. Turns to both left and right were performed, and stability seems strong in all axes. Most of the cruise testing was done at approximately 1350 RPM, but the tachometer calibration seems questionable. Airspeed was about 140 mph indicated at that setting. Flaps were lowered through full range below 100 mph, and stability was good. Stalls were not approached (although the landing behavior was excellent, so we anticipate good stall characteristics). Oil pressure was solid at 80 psi, oil temperatures never got above 140 – 150 degrees. VSI reads in the correct direction, but calibration is unknown. Airspeed indicator and altimeter appear to be reasonable. Compass may or may not be adequate – will have to further evaluate. After orbiting the field several times, the flight let the pattern, flew about four miles to a neighboring field, then returned for a pattern entry. Flaps were lowered below 100 mph to two notches on downwind leg. Trim was all the way nose up, but additional backpressure was required to hold an approach speed of about 75 mph. This was not uncomfortable, but it appears that there is inadequate trim force available to hold a slow approach speed. I considered lowering full flaps on final approach, but the geometry of the cockpit and flap lever made this too difficult to attempt on final, so the landing was accomplished with 2/3rds flaps? The landing round-out and flare was positive, very stable, and easily predictable. A three-point landing was attained on the first try, and brakes were not applied until it was clear that the airplane was done flying. Control was good, and there was no tendency for it to depart either right or left – surprising, given the visually obvious gear alignment issues. The alignment does not need to be adjusted for flight purposes. 1.2 flight hours: This one flys great, just like an RV – quick and light. Tracks stright. Climbs at 110 mph like an RV. Cruises 140mph @ 2400 rpm, 130mph @ 2300rpm, and 110mph at 2000rpm. Stalls at 62 IAS (VS) and 58 IAS (VSO). These need to be checked. Flaps at 90 and approach at 75 then 70.The stall is better than most RV’s I’v flown. This is an honest aircraft.